Behind The Wall. © Copyright 2019 G Dan Mitchell – all rights reserved. The “backside” of the Berlin Wall at the East Side Gallery. A possible alternative title for this photograph could be “Back Side Gallery.” Get it? OK, I’ll explain. 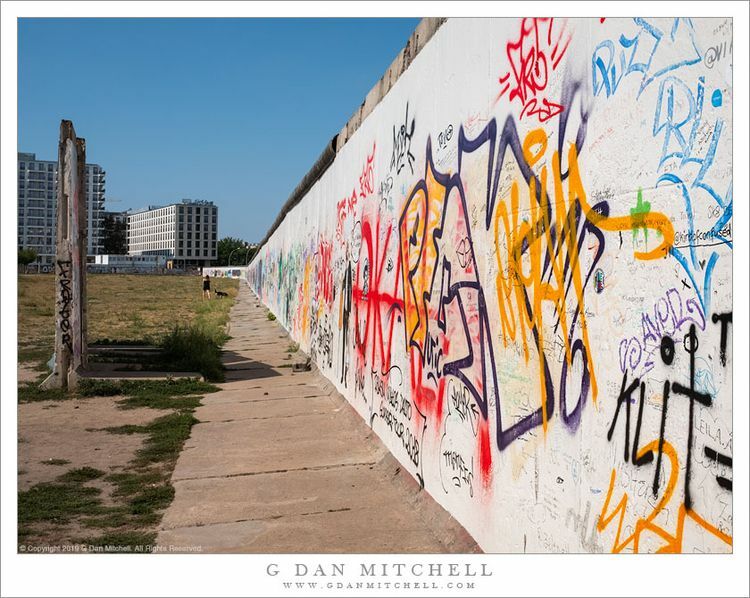 The wall is The Wall, a remnant of the old Berlin Wall. This section is now known as the East Side Gallery, and on the other side (the “front side”) it features a wonderful array of street art that memorializes and comments on the Wall, its history, and a range of related subjects. The East Side Gallery is, among many other things (most of which are likely more significant than what I’m about to write) a powerful example of how art claims out attention and can, at least temporarily, distract our vision from the mundane. The location of this section of the wall is unremarkable. One one side (where most probably don’t look) is this empty field, a plain wall covered with graffiti, and not much else. On the other side, as you stand looking at the “Gallery” portion, behind you is a busy roadway and an area filled with architecture that is not exactly eye-catching. But if you stop and take in the street-art side of the wall and the impromptu street theater produced by visitors, all of the rest of that temporarily disappears.